It’s been a whirlwind week thus far for Jon Jones, and he hasn’t even entered the Octagon to challenge Mauricio “Shogun” Rua for his title yet. 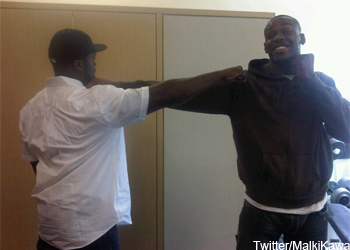 While Jones hasn’t hoisted the UFC light heavyweight crown, it didn’t stop “Bones” from rubbing elbows with one of hip-hop’s kings. 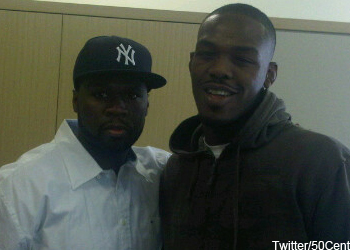 On Tuesday, Jones stopped by the ThisIs50 offices in New York City for an interview on 50 Cent’s entertainment network. While countless superstars have come through his famed studio, 50 hasn’t always had the time to greet his guests. Jones has been a longtime fan of the rapper. For the third consecutive time, the 23-year-old will have 50 Cent’s “God Gave Me Style” blaring throughout the arena as he enters the biggest fight of his life. UFC 128 takes place this Saturday inside the Prudential Center in Newark, New Jersey.